Rory McNamara rolls in the winning putt on the 14th in the final of the West of Ireland Championship at Rosses Point. Photo Jenny Matthews/www.golffile.ieThe killer instinct is crucial in matchplay and Headfort’s Rory McNamara showed that he has it in spades when he put Muskerry’s Niall Gorey to the sword en route to an emphatic 5 and 4 victory in the final of the Radisson Blu sponsored West of Ireland Amateur Open at Rosses Point. As if on cue from the golfing gods, the Arctic-like conditions that marred the first four days gave way to more benign southeast breezes that allowed the large gallery to shed the gloves, if not the winter woolies. But the real hot stuff came from 23-year old McNamara in a scrappy final that was all square until they came to the 159-yard ninth. A winning par there was the first of four wins in a row for the Headfort man and while Gorey briefly stopped the rot with a half in par at the 13th - a hole he really had to win - there was to be no repeat of his dramatic semi-final comeback against Mourne’s Reeve Whitson in the semi-finals. Terry Brady (Captain of Co.Sligo Golf Club) with 2013 Winner Rory McNamara (Headfort). Photo Jenny Matthews/www.golffile.ieFour down against the recently-crowned Spanish Amateur Open champion with five to play, the Muskerry player birdied the 14th to provoke a dramatic collapse from the talented Whitson, who bogeyed the 15th, 16th and 18th to be taken to extra holes, where he lost after another bogey at the 19th. Reeve Whitson on the 16th tee in the semi-finals. 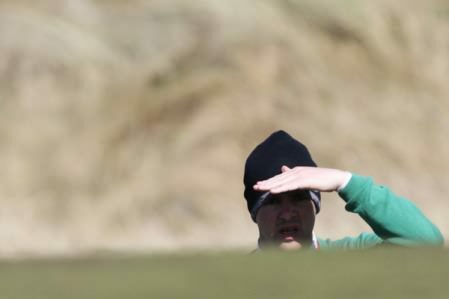 Photo Jenny Matthews/www.golffile.ie“I just lost the plot a bit and lost my concentration,” Whitson said. “Niall made a great birdie on the 14th to get back to three down and then I hit a bad tee shot on the 15th and from there I was just up against the momentum. “I wasn’t swinging badly but went into the bunker on 15 off a good swing. Then on 18 I hit a good shot in over the flag and flew the entire green. Niall Gorey checks out his options on the fourth. Photo Jenny Matthews/www.golffile.ieIf Whitson lost focus, Gorey quickly discovered that McNamara to be anything but forgiving as the 23-year old closed out the match at the first opportunity with a rock solid par four at the 14th. Defending champion Harry Diamond fell to McNamara in the semi-finals. Photo Jenny Matthews/www.golffile.ieHaving won the ninth with a par three to go one up, McNamara hit a seven-iron to two feet at the 10th to set up a birdie and go two up before claiming the 11th in par after Gorey took four to reach the green, bunkering his recovery from the right rough after a pulled drive and a weak second. The par-five 12th would be crucial and with Gorey 10 feet away in three after another average iron shot, McNamara hit a stunning chip across the shoulder of the green that hit the pin. Gorey lipped out from 10 feet for birdie and tapped in for a winning birdie for a four up lead that would prove too much to handle. Gorey responded to a fine McNamara tee-shot to 25 ft at the 13th with a superb approach to 10 feet. He needed a birdie but missed the putt, confessing later that his morning comeback over Whitson crossed his mind as he stood over it. Rory McNamara in action in the final of the 2013 West of Ireland Championship at Rosses Point. Photo Jenny Matthews/www.golffile.ieThis time there was to be no dramatic late comeback and it all ended at the next where McNamara displayed the assassin’s instinct that had brought him a 4 and 3 win over defending champion Harry Diamond in a semi-final dogfight he simply refused to lose. Gorey could not afford a mistake but playing first to the green off a good drive, he carved his approach into the jungle right of the green. “When I saw Niall in trouble, I said, right, just close it out and I hit a nice five iron in there,” McNamara said. His 25 footer slipped three feet past but after Gorey failed to get up and down, missing his 15 footer for par, the Headfort talent calmly stroked home the winning putt to add the “West” to his win in last year’s North of Ireland Championship. Niall Gorey congratulates Rory McNamara on his victory. Photo Jenny Matthews/www.golffile.ieAfter two winters studying at a golf academy in Spain, he spent this year at La Cala near in Marbella, simply working to get better. And while he’s almost certain to enter the European Tour Q-School as an amateur in the autumn, he’s happy to take advantage of the opportunities afforded him by the Golfing Union of Ireland set up. Son of a Sligo woman, his victory was hailed as heartily as a home win last achieved by Cecil Ewing in 1950. But it wasn’t all pretty, especially over the first eight holes. With 1973 champion Des Smyth giving them a send off, Gorey won the first in par but lost the second to a four after getting in trouble with his second and bunkering his third. He chipped dead for birdie at the third but McNamara got up and down from greenside sand on the right to remain all square. Rory McNamara drives off the 11th. Photo Jenny Matthews/www.golffile.ieAt the par three fourth, McNamara went long and left before Gorey overshot the green, finishing in the swale well below the putting surface. McNamara pitched to eight feet and looked on as Gorey’s first putt failed to climb the bank, topping back down again. He putted up but missed for bogey and conceded the hole to o one down for the first time. Both hit fine shots to the eighth but Gorey, who had a 12 footer for the win, missed and on they trooped to the ninth, still all square. Niall Gorey lets rip in the final. Photo Jenny Matthews/www.golffile.ieGorey pulled his tee shot just off the green before McNamara hit a stunning five iron to eight feet and while he missed the putt, par turned out to be enough to win the hole as his opponent missed from six feet for par. What followed was a McNamara scoring rampage. Gorey, running on empty after a long week, simply couldn’t reply. McNamara now has two and if the pro rank don’t get him too soon, there are more to come. West of Ireland Amateur Open (sponsored by Radisson Blu Hotel & Spa), Co Sligo GC. Rory McNamara (Headfort) bt Harry Diamond (Belvoir Park) 4 and 3. Rory McNamara bt Niall Gorey 5 and 4. Delgany’s Simon Bryan drives at the seventh in the second round of the West of Ireland Championship. Photo Jenny Matthews/www.golffile.ieHeadfort’s Rory McNamara remained on course to make up for two semi-final defeats in the last three years when he added a 70 to his opening 74 to lead the qualifiers in the clubhouse in the Radisson Blu sponsored West of Ireland Championship at Rosses Point. Gary McDermott made just one bogey in the second round, here at the 14th, in an otherwise faultless display. Picture courtesy www.countysligogolfclub.ieYouth had its fling on the opening day of matchplay combat in the West of Ireland Championship. But while there were plaudits for the likes of teenagers Gareth Lappin, Paul McBride and former boy wonder Jack Hume, it was local hero Gary McDermott who made the biggest impression in Artic-like conditions at Rosses Point. Gary McDermott hits his tee shot to the 16th in the third round of the West of Ireland Championship. Picture Jenny Matthews/www.golffile.ieGary McDermott remained on course to end County Sligo’s 63-year wait for a home-grown winner when he beat Knock’s Nicky Grant 3 and 2 to reach the quarter-finals of the West of Ireland Amateur Open at a bitterly cold Rosses Point. Niall Gorey drives on the eighth in the quarterfinal win over Gary McDermott. Photo Jenny Matthews/www.golffile.ieYou know you’re doing something right when you impress such an august triumvirate as former West of Ireland champions Des Smyth, Barry Reddan and Declan Branigan with your play in freezing, 30mph gales. Defending champion Rory McNamara heads a strong field for this year's Radisson Blu sponsored West of Ireland Amateur Open at Rosses Point.